Appreciate the collections at Casa Batllo and Casa Mila - La Pedrera. Do your shopping at La Boqueria and MACBA- Museo de Arte Moderno de Barcelona. There's lots more to do: admire the striking features of Basilica of the Sagrada Familia, take in the exciting artwork at Base Elements Urban Art Gallery, tour the pleasant surroundings at Parc Guell, and take in the architecture and atmosphere at Barcelona Cathedral. To see traveler tips, reviews, maps, and tourist information, you can read our Barcelona trip itinerary planning app . Porto Alegre, Brazil to Barcelona is an approximately 16.5-hour flight. You can also do a combination of bus and flight. Due to the time zone difference, you'll lose 4 hours traveling from Porto Alegre to Barcelona. Expect cooler temperatures when traveling from Porto Alegre in February; daily highs in Barcelona reach 17°C and lows reach 7°C. Finish your sightseeing early on the 7th (Thu) to allow enough time to take a train to Madrid. Get some cultural insight at Royal Palace of Madrid and Prado National Museum. You'll explore and learn at Museo Nacional Thyssen-Bornemisza and Canal Art Exhibition Centre. Change things up with a short trip to Real Monasterio de San Lorenzo de El Escorial in San Lorenzo de El Escorial (about 54 minutes away). There's much more to do: browse the eclectic array of goods at Mercado San Miguel, admire the striking features of Retiro Park, get a taste of the local shopping with Cava Baja Gallery, and take in the exciting artwork at Diseno Propio. Artesania..
To see more things to do, traveler tips, maps, and other tourist information, read Madrid day trip planning app . You can take a train from Barcelona to Madrid in 3 hours. Other options are to fly; or drive. In February, Madrid is little chillier than Barcelona - with highs of 13°C and lows of 3°C. Finish your sightseeing early on the 13th (Wed) to allow enough time to travel to Miami. Start off your visit on the 14th (Thu): examine the collection at Vizcaya Museum and Gardens, buy something for everyone on your list at Dolphin Mall, then shop like a local with Aventura Mall, and finally don't miss a visit to Bayside Marketplace. 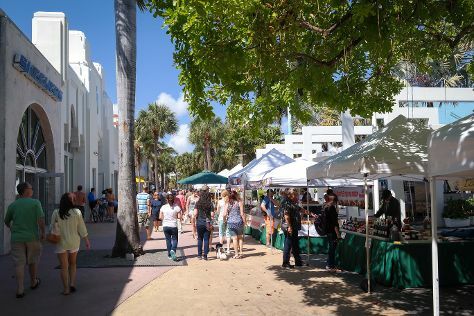 Here are some ideas for day two: wander the streets of Ocean Drive, then get to know the fascinating history of Art Deco Historic District, and then wander the streets of Lincoln Road. To find photos, reviews, traveler tips, and other tourist information, you can read our Miami holiday planning app . You can do a combination of flight and tram from Madrid to Miami in 11.5 hours. Another option is to do a combination of flight and train. You'll gain 6 hours traveling from Madrid to Miami due to the time zone difference. Plan for much hotter temperatures traveling from Madrid in February, with highs in Miami at 30°C and lows at 21°C. Wrap up your sightseeing on the 15th (Fri) early enough to travel back home.